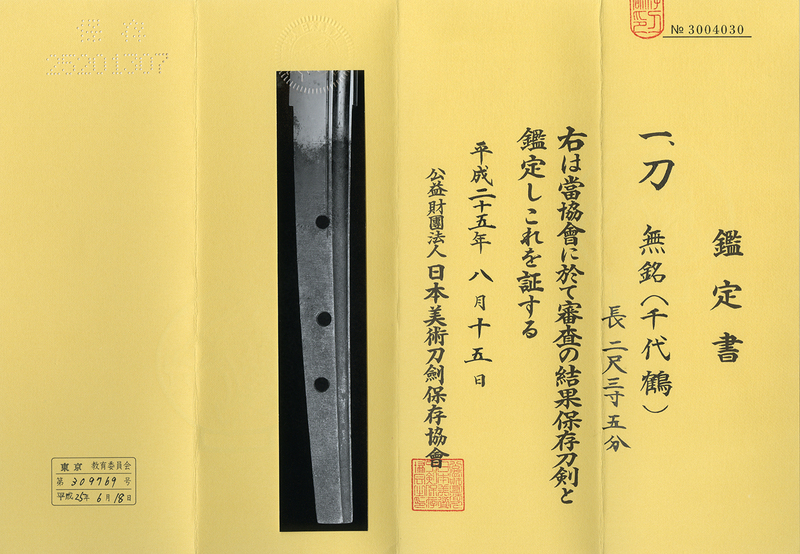 Shape : The blade is wide and thick, has a deep sori and a long kissaki. Oo-suriage. a Bohi and a soehi is carved into the blade. Jigane : Koitamehada well grained, jinie attached. has a soft feeling. Hamon : Niedeki Suguha, Gunomemidare partly. Boshi is round. Special Feature : Chiyozuru was named after the childhood name of Kuniyasu who was the founder of Echizen Rai. The first generation was active at Nanbokucho period. There is only few works with the signature, such as two generation(parent and son) Kuniyasu, Morishige, Morihiro and others. There is also Shigekuni and Kuniyuki in the same generation. From Aoi Art : Chiyoduru’s works are popular for marriage and celebration because of the auspicious name. as gifts and the servants kept them as heirlooms. Army Koshirae for his son leaving for battle.